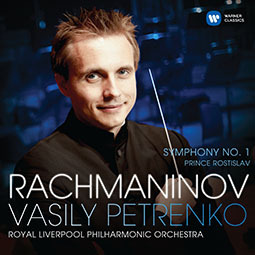 Vasily Petrenko and The Royal Liverpool Philharmonic Orchestra conclude their Warner Classics Rachmaninov cycle with a rarely heard symphonic poem on the heroic subject of a prince who sacrifices himself to save his family. The composer himself was sacrificed on the altar of public opinion after the disastrous premiere of his First Symphony, which has won deserved if belated recognition as fully characteristic of his free-flowing, yearning lyrical style. Also on this disc is the symphonic poem, Prince Rostislav, composed a few years earlier and one of Rachmaninov’s earliest surviving compositions for orchestra.